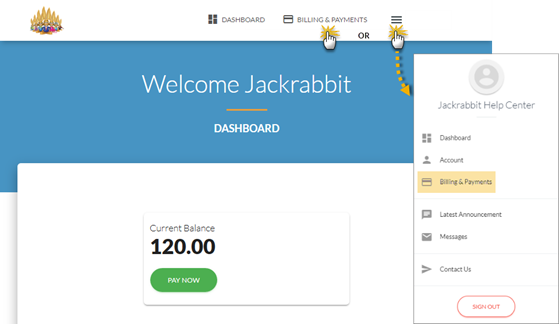 Review Jackrabbit's billing policies, referral bonus plan, service "hold" options & more! Access to the Jackrabbit Customer Portal is located on the My Account page from the Tools menu. Any user who has the authority / ability to Manage User & Permissions (Tools menu) is able to see the My Account page. This permission can be removed by updating the user's permissions in Tools > Manage Users & Permissions. The first time you access your organization's Billing Portal, you will create your password by requesting a reset which sends you a time sensitive email with a link to reset your password. The email is sent to the address our Billing Department has on file as the Billing Contact email. Your database login credentials (User ID and password) cannot be used to access the Billing Portal. If you do not recall the Billing Contact email, reach out to our Care Billing Team for assistance. In your database, point to Tools and select My Account. Scroll to the Billing Info section and select the Billing Portal link. Enter the email address that billing has on file as the Billing Contact for your organization and click Send Reset Email. In the password reset email select the Click Here to Reset Your Password link to create your password. Note: The link in the reset email is only valid for 24 hours. Your payment and billing contact information can be updated in the Billing & Payments area of your Portal. Get to the Billing & Payments main page using the Billing & Payments link at the top of your Portal, or by dropping down the side menu and selecting Billing & Payments. To update your Billing Contact information, select Contacts. Use the EDIT link in the contact card to edit the Billing Contact currently on file with our Billing Department. 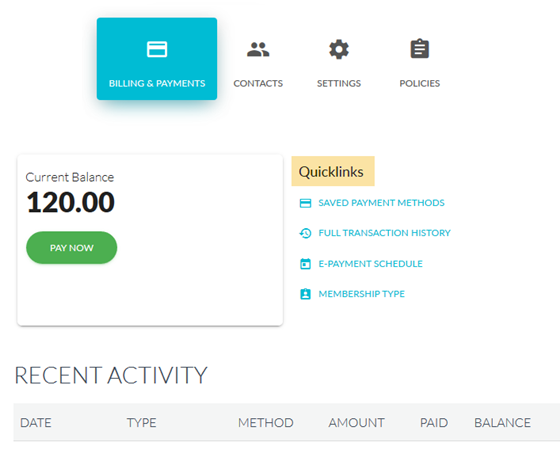 Your payment information is updated in the Billing & Payments section, with the Saved Payment Methods Quicklink. See Manage Credit Cards in the Parent Portal for a full step through. Only Credit/Debit card information can be changed via the portal. Bank Draft (routing and account number) information must be taken over the phone. Email carebilling@jackrabbittech.com to request an update of Bank Draft information. Your Recent Activity is displayed on the Billing & Payments main page. 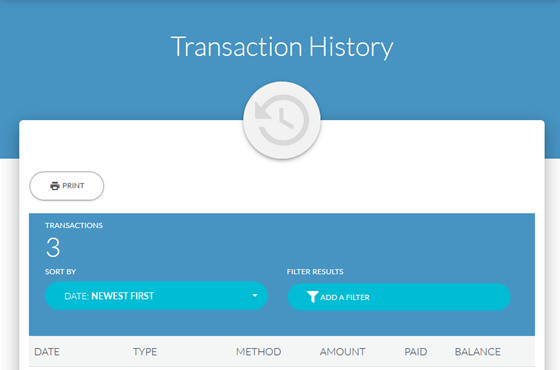 View and print your entire transaction history with the Full Transaction History Quicklink. Bank Draft payments are not accepted if the account is overdue. Overdue fees must be paid via Credit or Debit card. Once logged into your Billing Portal, navigate to the Account page (from either the Billing & Payments option or from the sidebar menu) and add a new Credit or Debit card to your account to clear your overdue fees. To add a Credit or Debit card, click the '+' icon. On the New Payment Method page choose Credit / Debit Card as the type, enter the card information, and click Save. 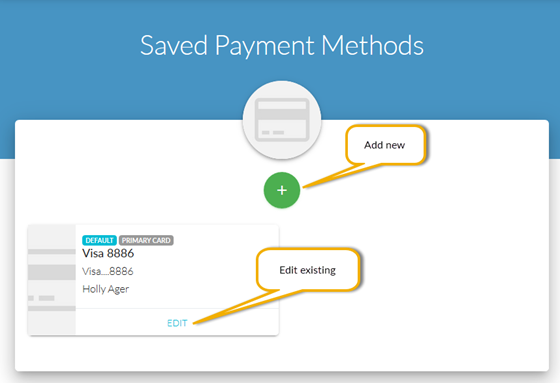 The Credit/Debit card is now shown on the Saved Payment Methods page. From the Billing & Payments page, or the Dashboard, use the Pay Now button to make your overdue payment. If the payment is approved, your Jackrabbit account will be automatically reactivated. Overdue accounts must be paid via Credit or Debit card. Follow the above instructions to add a Credit or Debit card to your Saved Payment Methods. Send an email to carebilling@jackrabbittech.com and request that a Credit/Debit card payment be initiated for your overdue fees. To review Jackrabbit's billing policies, learn about our Referral Credit program, and more, go to the Policies section of the Account page.